kelbysews: Ta-Da! I Paper Pieced! I never paper piece. Never. It's not that I can't, it's just I don't have that kind of patience. 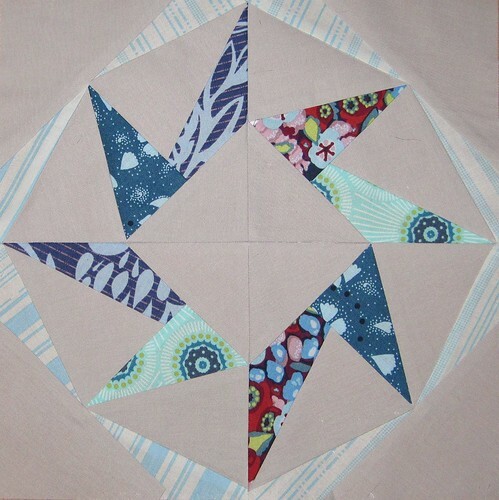 However, March is Katie's month in my virtual bee, The VIBs, and she sent some yummy Anna Maria Horner fabric and Kona Ash and asked for a star block. Any kind of star we wanted! I really could have gotten out of this much easier, but I found a cool star pattern I liked called Rolling Star so I sucked it up and paper pieced. I did have to rip a couple of seams at first because I kept forgetting that I had to fold the fabric over AFTER I sewed the seam. In the end, I'm pleased with the results and I hope Katie is too! Oh, and if you're here for the giveaway, click on THIS. Friday I will announce the winners! Great job on this, Kelly! I've only done paper piecing on one project and it was so confusing in the beginning, but the results are always spectacular. That's a great star! So different from the norm! Can't wait to see your first tute. This is really cool, Kelly! Thanks for the link to the block! I'm going to have to try this now that I saw yours!! gorgeous block - Job well done! That's really awesome! I love bees for just that reason, you can try something new on a small scale. Yours is great. I love this block, great job! I've bookmarked the pattern in case I have time to try one myself. I only paper piece once in a while, but I am always pleased with the results. This is so beautiful! Neptune is an amazing line and I really love what you've done with it!.